Ashley Neese was first introduced to us at her home in Los Angeles. Here we were taken on a tour of her neighborhood and local farmers market while she discussed her decision to make a change in direction after discovering her body could not tolerate dairy. Switching to a vegan diet and a healthy dose of yoga has given Ashley a new lease on life. We are very pleased to announce the first recipe on the FvF journal as part of a selection of monthly inspiring and healthy meals and snacks by a range of FvF guests, contributors and industry experts. This inspiration led her to help others improve and make changes to their lifestyles as a wellness coach. We hope this series of recipes will also provide our readers with a source of inspiration for healthy living! Preheat oven to 350°F. Lightly coat a 8×8 inch square baking pan with coconut oil and set aside. 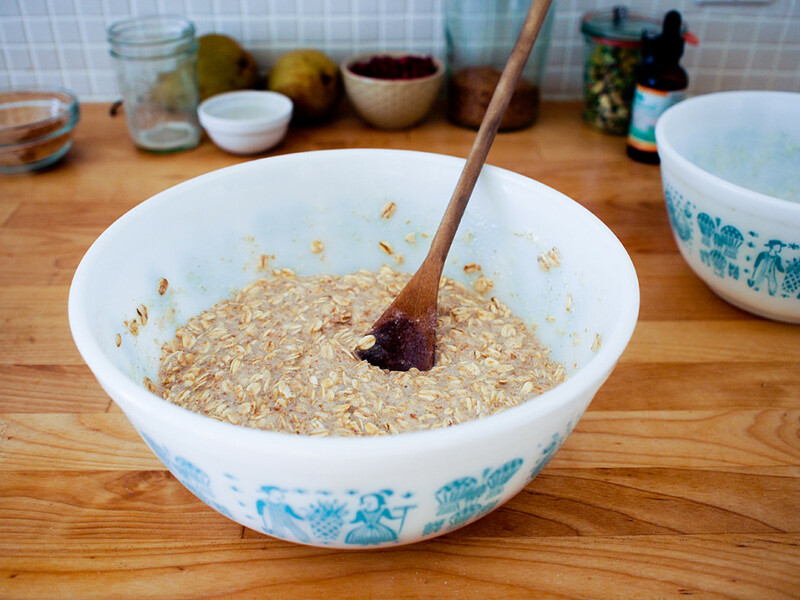 In a large mixing bowl add the oats, baking powder, ginger, cardamom, vanilla powder, cinnamon, and salt. 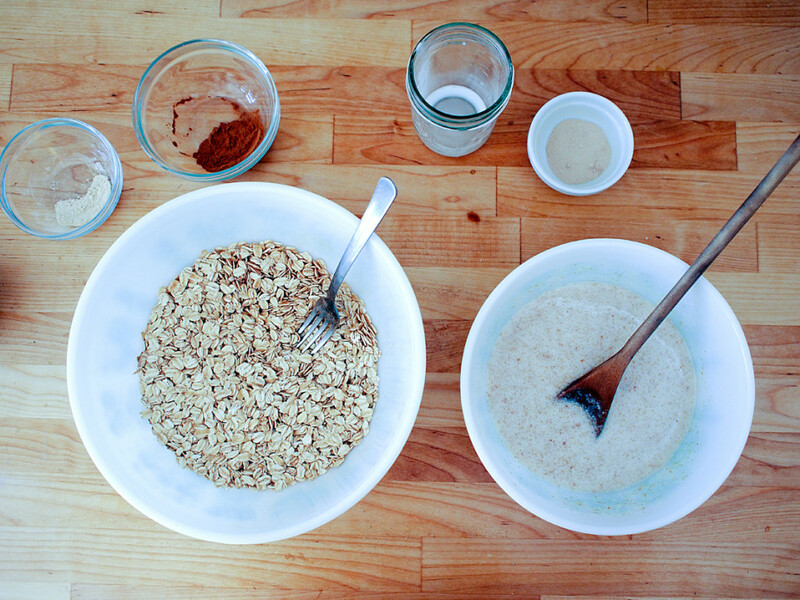 In a small bowl mix the ground flax and warm water. wooden spoon. Add the pears and gently stir. 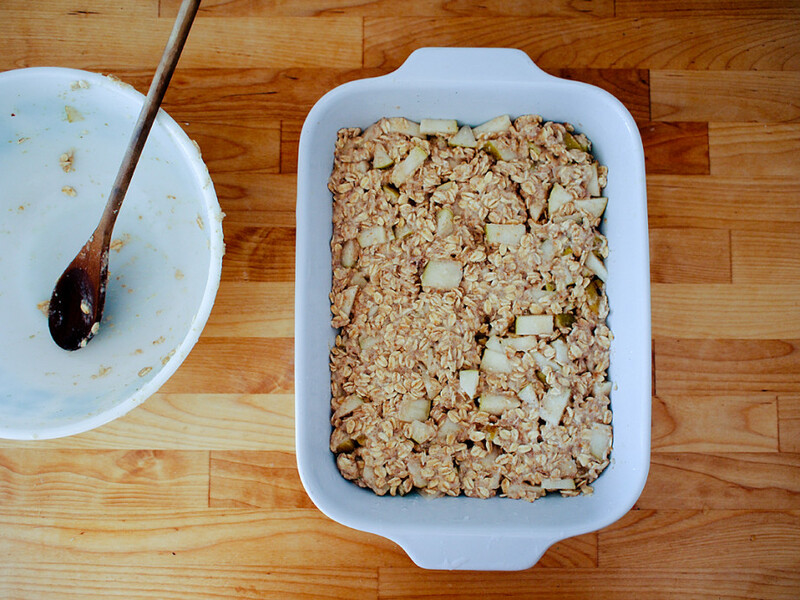 Spoon out oatmeal mixture into the oiled pan creating an even layer. Place in oven and bake 25-30 minutes until top is dry and slightly crispy. 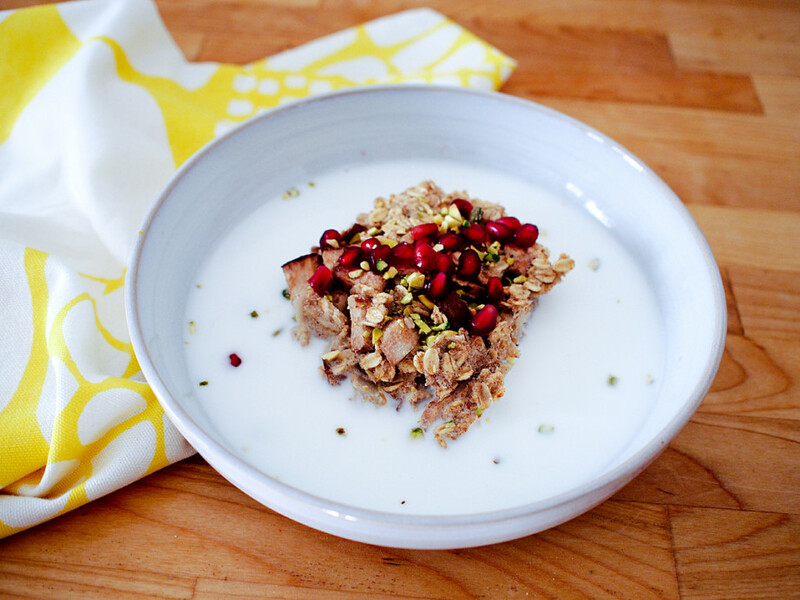 Cut into desired shapes and serve in shallow bowls topped with a few pinches of pistachios and pomegranate seeds. Pour almond milk on top if desired. American breakfast make for a delicious and interesting meal. I really like Anjou pears for this but use what is local and easy to find. 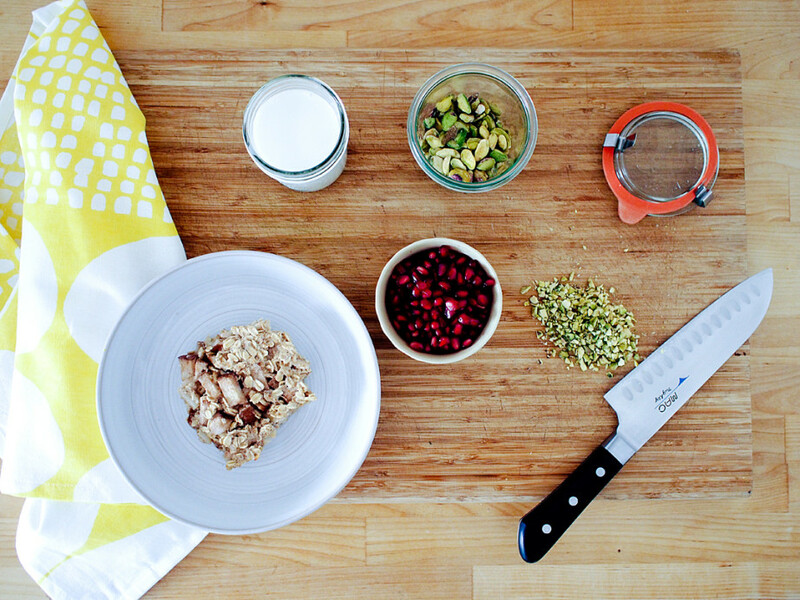 The crunch of the pistachios and pomegranate elevate this dish from a run of the mill oatmeal recipe. This dish keeps well in the fridge for 4 days and is easy to reheat in an oven. Reheat at 250°F for about 15 minutes. If more sweetness is desired add it afterwards as an additional topping. 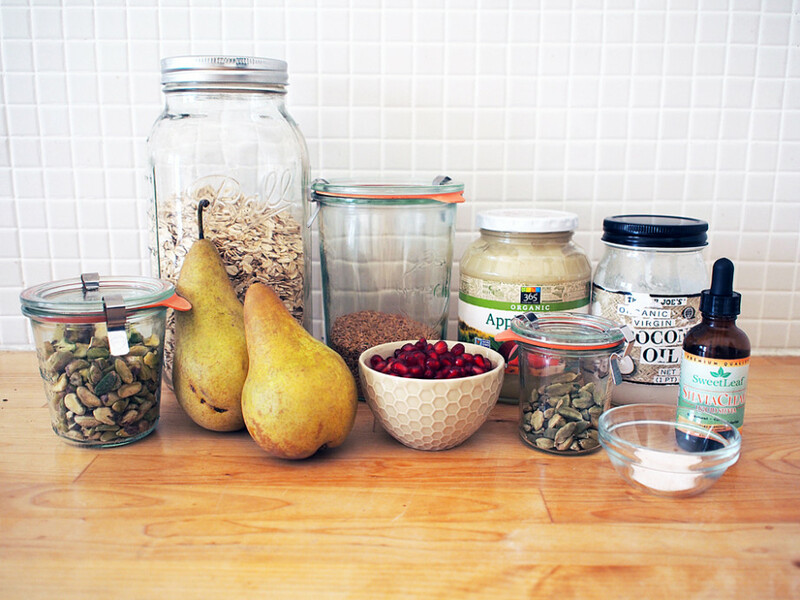 This breakfast is very filling and the flavors work well together. You can also make this the night before and bake it in the morning to save time.